The Goat mascot poses with Hopkins students. The prominence of the goat has defned human history for centuries. “How is this?” You might ask, “Aren’t those silly, bleating animals just for viral ‘Taylor Swift’ videos?” To those unpatriotic individuals, I say, “Hircus caprarum rex!” Goat is king! The prominence of the goat has defined human history for centuries. “How is this?” You might ask, “Aren’t those silly, bleating animals just for viral ‘Taylor Swift’ videos?” To those unpatriotic individuals, I say, “Hircus caprarum rex!” Goat is king! While theories often merit great stories, the truth of how the goat came to The Hill can ultimately be attributed to Tom Peters, a member of the History Department and the School Archivist. He was able to provide insight into the origin of the goat as Hopkins’ mascot. Back in 1995, when he was a Head Advisor for the Junior School, the Development Office asked Peters to incorporate the Junior School in Homecoming. “Since other classes were already doing burgers and drinks and chips and candy, I had to try and find something else,” said Peters. Peters came up with the idea of finding a mascot with which they could charge people to take pictures. There was a student in the 8th grade at the time whose family had a farm and a goat. “I was able to get her father to allow us to have Sable the goat as our token Hilltopper,” said Peters. “I began to think about what else climbs mountains, so I thought mountain goats but I knew I couldn’t get a big mountain goat with curly horns so I was willing to settle for a goat-goat,” explained Peters. 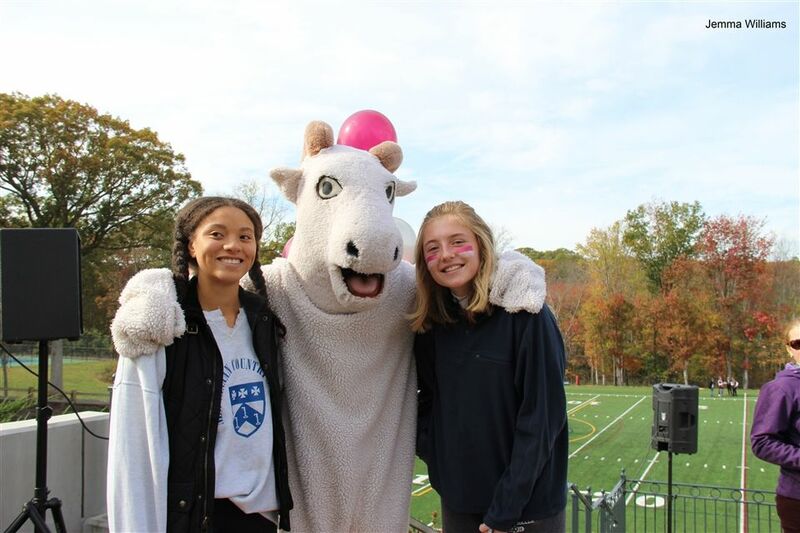 That same year, when word got out that Hopkins was going to have a live goat at Homecoming, the Hopkins Student Council decided to boost school spirit by having someone dress up as the mascot at school events. According to a 1995 Razor article, “Goat Fever Infects The Hill,” the present day goat attire was custom made in 1995, and implemented during the winter season of that same year. While the goat costume and the living breathing mammal, itself, were introduced relatively recently, the idea of The Hilltopper has been existent since the early 1950’s. Beginning in 1945, a struggle began as to how Hopkins would refer to itself. From 1952 until 1955, the Hopkins ‘team name’ shifted between The Maroon and Grey, the Lovell Men, the Hopkins Grammar School, and The Hilltoppers, with the school settling on The Hilltoppers in 1956. Hopkins was then continuously referred to as The Hilltoppers, which although alluding to a goat, would not have a physical embodiment until 1995, when Tom Peters would introduce Sable at Homecoming. Over time, the mascot has taken on different meanings for students and faculty. Hopkins alumnus ’88 and current English teacher Ian Melchinger said, “Maybe the ‘Hilltopper’ reminds us that we enjoy incredible privilege and luxury up here, and that we owe our city the perspective and generosity that comes from living on top.” It’s a message the school can get behind.